There seems to be quite a lot of fish about both coasts at the moment. Not too many big fish reported this week though. Northland seems to be the place to be catching snapper with your kite. Robbie Cullen, a member of the Kitefishing Club went set his longline rig off the west coast at Dargaville and landed 20 fish for his efforts. The catch included 16 snapper, a gurnard, a small shark, one trevally and a huge kahawai. The day was windier than what Robbie was expecting, gusting between 45- 60 knots at various stages during the day. The same day Robbie was out the Kitefishing Club held their club day at the top end of Muriwai. There was a total of 26 snapper caught, 10 kahawai, 6 gurnard and even a john dory. The john dory was landed by Tim Gerard on his Flexiwing Rig. Eric Easton put his rig about 900m offshore and landed the biggest snapper of the day weighing a very healthy 9.5Kgs. Dave Edlington, the Kitefishing Club president managed a snapper of 4.1Kgs. Apparently Dave is an expert in catching snapper of this size, there is a photo on our website with Dave and his last 4.1Kg snapper. Over the past weekend Kerry Rabe set his kite out between Dargaville and Pouto on the west coast and also had a good catch for the day. Kerry managed 14 snapper from 2 sets of 22 hooks. The largest weighed 4kg. All of Kerry's fish were full of crabs and mussels. 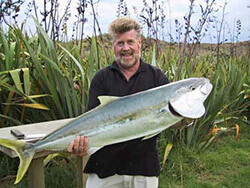 Kerry was using mullet and salted trevally bait on his day out at the beach. There were some good fish weighed in at the Chesters Plumbing annual fishing contest last weekend. The biggest snapper weighed 9.5Kgs, the biggest kingfish was a very respectable 19.5Kgs. The crayfish were a sight to behold! The winning crayfish was a packhorse cray weighing 5.6kg. I went out to our favourite trevally spot on the Manukau to try to catch the winning trevally for the contest. Our spot is well up the harbour but very rarely fails before daylight. This place regularly produces trevally up to 3kg. Do you think I could catch a trevally? Using a running sinker rig, with a 4/0 Target Hook, I just couldn't get past the snapper. The majority were above legal size, but snapper wasn't what I was after at the time. While the other two on the boat were bringing in good sized trevally, my Target Hooks were catching all the snapper. We had a good morning out all the same, with a smokehouse full of fish the next day even though we didn't win any prizes. Hi Great site. Could spend a lot of time reading all the articles, and probably will! We are new to kite fishing but thoroughly enjoy it. We got into it after buying a kontiki and losing half of the line in the surf at Muriwai, real amateurs then! After converting the kontiki rig to a kite rig using a nighthawk and small sky hook we have had more success. We have fished Pakiri, great on the incoming tide, Hatfields, OK but pretty small, Orewa, again pretty small and no one was having any success both times and Muriwai where we have mostly caught sharks. Have convinced my wife that to get better catches at Muriwai we will need to drive up the beach. She was a bit reluctant as the all wheel drive Subaru Forester is her company car! Last Saturday we fished Muriwai South arriving about 9:00am, just before high tide. Because of this we left the car in the car park and walked down to the beach. Because we walked we fished almost straight down from the entrance. Put the kite out retrieved after about 20mins, 1 sand shark and 5 baby sharks. Reset, retrieved again 20 mins, 7 baby sharks. Reset, retrieved 20 mins, 8 baby sharks. Gave up. Took 2 sharks home tried one as raw fish very good, the I salted and left it overnight and smoked for lunch Sunday again very nice. My daughter also took one home and smoked that night but tasted like chlorine. Yuk! Keep up the good work. I will report regularly as we try fish at least one day a weekend. Had to let you know about this one - tried our newly purchased dropper rig kite we purchased from your Onehunga shop the Monday before). First time out on Friday evening on Ripiro Beach (west coast north of Kaipara) in an off shore wind we managed to tack it some 20degrees to get it perfectly straight out from shore. All the locals were very skeptical (all ardent rod surfcasters who I had played the kite video to an hour before) as we pulled in the catch. One even brought a large plastic container as a spoof for all the fish they thought wouldn't arrive. Two snapper came in first (we only baited 11 hooks as per the beginner advice on the video) and then the kingi!. About 25LBs. Does it get any better? It wouldn't fit in the plastic container the guy brought down! What a start - beginners luck they said - who cares. We are hooked - we only had one small problem - we lost one of the sinkers - the biggest one - it never came in with the fish.